On July 26, 1997, in Birmingham (Michigan, USA), at the age of 46, Thomas M. Kuras, a consummate artist, eminent scholar and generous man, quietly passed on. We would hereby like to pay public homage to this accomplished musician, virtuoso organist, pianist, harpsichordist, forte-pianist, and also, choirmaster, singer, musicologist, composer and teacher, not to mention a distinguished linguist. He spoke—in addition to English (his native tongue)—Italian, German, Dutch and French, as well as read classical Greek and Latin! As a performer, he appeared with his ensemble Chamberworks and gave numerous recitals for harpsichord or organ. He played ambitious musical programs, among which were featured several complete works for organ by Johann Sebastian Bach, Pachelbel, Buxtehude, Brahms, Widor, Vierne, many compositions by Duruflé and Franck, and Handel’s Concertos. When he played the harpsichord in Bach’s challenging Fifth Brandenburg Concerto, a critic didn’t hesitate to write that "Kuras was impressive." Among the many works, this artist allowed the public to rediscover, of note is the Passion According to Saint Luke by Telemann. Its American premiere was on April 16, 1976. 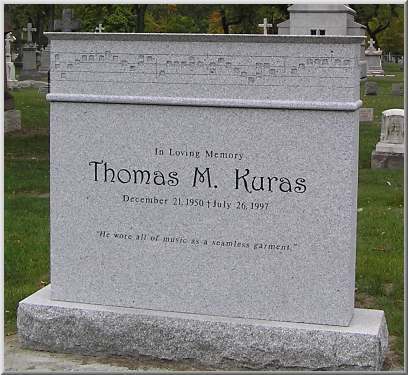 Kuras was also a talented improviser and a keyboard virtuoso. The American journal, The Diapason (Nov. 1995), reviewed a concert for the Organ Historical Society Convention, where he played compositions by Bossi and Dubois, as well as his own Postlude sur "Vigiles et Sancte", saying that he played "a thrilling improvisation on not one but three submitted themes [which] brought down the house." Born December 21, 1950, in Detroit (Michigan, USA) and of Polish ancestry, Thomas Martin Kuras was the youngest child of four. He had a difficult childhood, suffering from the absence of his father. Overwhelmed by various demands his mother had little time for her son. He was a timid youth in fragile health, left much to his own devices. Later, his sister Rosemary helped him significantly, becoming his musical benefactor. Thomas’ extraordinary memory helped him with his music studies largely in self-taught fashion. He began by learning to play piano, and then he took lessons from the organist at Epiphany, a Catholic church in Detroit, located next to the elementary school he attended. As a result, at the age of 12 in 1962, he was named organist at Saint Alphonsus in Dearborn, Michigan a position he kept for eight years, helping him pay for his studies at the University of Detroit High School. That is where he learned ancient Greek and Latin; he graduated in 1968. While in high school, Thomas pursued a music course between 1963 and 1968 at the Palestrina Institute of Detroit. This organization, which closed in the late sixties, was originally founded in 1940 by René Becker and his son Francis, both of Alsatian descent, and funded by the Archdiocese of Detroit. The school was established to teach sacred music to future ecclesiastical musicians and promote religious music in accordance with the motu proprio of Pope Pius X. 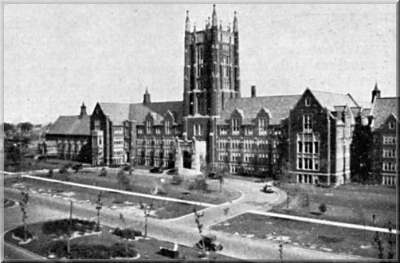 The program was first called the Palestrina Foundation of Detroit, and it welcomed boys ages thirteen to eighteen, who learned organ, piano, chant, music theory, solfège, harmony, composition and counterpoint, as well as liturgy, general music history (more specifically, religious) and choral conducting. At this school, Thomas Kuras took classes from the Belgian organist Lode Van Dessel1 for whom Kuras maintained a deep and lifelong gratitude. Van Dessel was to be the only real master whom Kuras would recognize as influential, especially since his teacher served as a father figure as well as mentor. Once he completed his studies in 1968 at the Palestrina Institute, Thomas Kuras went to Wayne State University in Detroit to obtain formal degree credentials, and not, as some might think, to perfect his musical knowledge. To hear many tell it, the level of musical education he received at the Institute was well above that of the University! This fact, compounded with his natural talent, made for strained relations with his professors. For example, a teacher once assigned a written exercise due the next class and with barely feigned satisfaction, Kuras handed it in at the end of the class period, thus embarrassing his teacher! After his first year, he abandoned his studies at Wayne State, but this in no way prevented him from taking the examinations for the degrees offered by the American Guild of Organists (AGO). First, he became an Associate after passing that exam in 1970. In June, 1971 he became a Fellow of the American Guild of Organists, at the age of twenty the youngest up to that time to have successfully passed the required examinations, which were generally regarded as difficult for those with doctorate degrees in music. For that year (1971), the tests were spread over two days, beginning with a forty-minute recital chosen from a possible three programs. He obtained the maximum score. The performance exam continued with the following: sight-reading an organ piece and a symphony excerpt, executing a sustained basso continuo by Bach, transposing two choral works by Bach, and lastly, improvising on two assigned themes. As for the written exams, he had a three-and-a-half hour time frame in which to complete a piece in counterpoint, write a fugue for four voices on a given subject and orchestrate a symphonic passage for certain designated instruments. This was followed by a final three-and-a-half hour phase consisting of musical dictations, completion of a passage from Reger’s Quartet, of which Kuras saw only a few measures (and at that, only those of the first violin), writing a piece for organ on a given melody, and finally, composing essays on three subjects pertaining to composition and music history. The portions of the exam on which he most especially excelled were the writing of the fugue, the dictations, the quartet and the essays. 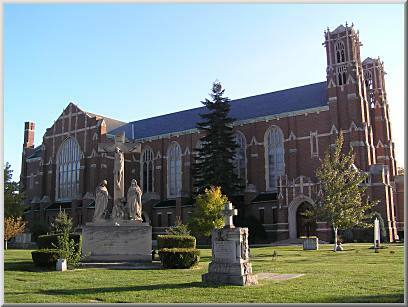 At age 17, Thomas Kuras left Saint Alphonsus to play the organ at the Cathedral of Most Blessed Sacrament of Detroit. He remained there for five years before being recruited as organist, cantor, musical director and choirmaster of Saint Joseph Catholic Church in Detroit2, under circumstances worth noting: on March 18, 1973, a large service was scheduled for the feast of Saint Joseph, for which a Mozart Mass was to be performed. 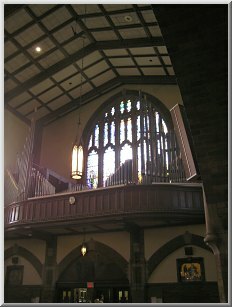 A new organ was in the process of being installed by William M. Worden to replace the original one built in 1873 by J.H.  & C.S. Odell (the second most important in Michigan at the time, electrified in 1915). A Baldwin electronic organ was substituted at the services. The organist for the service could not reach the church due to a snowstorm and Thomas Kuras was called in at the last minute. Despite all his good will, Kuras arrived after the Kyrie, and though he didn’t relish touching an electronic organ, he took to the keyboard with the keyboard/vocal part as his only score. The continuo realization for organ of Mozart’s Mass was in the hands of the snowed-in organist. So Kuras improvised a continuo at sight from the vocal score. 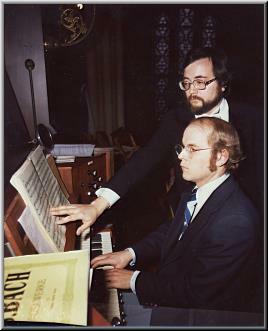 Thomas’ talent so impressed the faithful and the clergy that he was hired soon after as the new permanent organist, starting January 1, 1974. 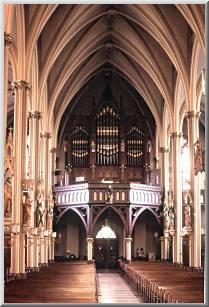 Meanwhile, once the new organ was completed, the instrument was inaugurated by Marie-Claire Alain on November 25, 1973. As for Kuras, he remained organist of Saint Joseph for twenty-three years, until the time of his death. At the church, Thomas Kuras continues and expanded a fine musical program. By 1982, he founded the choral and instrumental ensemble Philomusica whose mission was to provide appropriate sacred music for major holidays and to present to the public little known masterpieces. Philomusica performed concerts locally as well as in Windsor, Ontario (Canada), and its repertory covered a vast time period, from the baroque to the 20th century, as well as works by the founder and musical director Kuras himself. In 1997, Philomusica voted to disband after Kuras’death. However, the Saint Joseph Capella, which had been established in 1985 by Kuras to sing bi-weekly choral services, survived, and it still performs to this day. For special holiday services, the Cappella is enlarged and called the Saint Joseph Academy of Music. In 1987, Thomas Kuras formed Chamberworks. The standing ensemble included a keyboard instrument, two violins and one cello, to which other instruments were added depending on the works being performed. This constellation focused particularly on baroque works, carefully researched by Kuras and shared with the musicians; he often set the sheet music on the computer to clarify the musical notation and ornamentation, creating his own editions. He enjoyed introducing the concerts himself, commenting on the works to be performed so as to enhance the public’s knowledge and appreciation. Kuras’ knowledge, his immense library of books and sheet music, not to mention his impressive collection of recorded music that reflected his eclectic tastes as much in the literary domain as in the musical one, allowed him to write texts that were superbly well-documented and of great interest. Kuras was fascinated by all forms of music, and every summer between 1984 and 1996, he would attend the Wildacres Flute and Chamber Music Symposium of Little Switzerland in the mountains of North Carolina. The symposium brought together baroque and modern flutists. He started as an accompanist to the baroque flutist of the Englishman Stephen Preston’s class, before advancing rapidly to harpsichordist in residence and teaching in his turn improvisation, accompaniment and editions of baroque music. Furthermore, for the regular closing concerts at the festivals, Kuras sometimes wrote specific works, for example, the unusual and amusing Chocolate Cantata for flute quartet—an impish nod at the Cantor and at his Coffee Cantata! Those days were the only vacation, if one may call them that, which he allowed himself. He waited impatiently for his days in the countryside throughout the year! During the 1980s, Kuras was a French teacher, choir director and concert organizer at the Waldorf School of Detroit. He also gave private organ, piano, harpsichord and pianoforte lessons; he taught theory, composition, basso continuo, as well as voice. He possessed a beautiful light baritone voice with an unusually large range, but usually sang as a highly skilled counter-tenor. 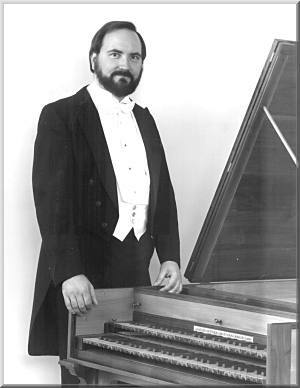 Kuras often gave lessons at home, where he owned several keyboard instruments: a German-made positive organ (with three stops, purchased from a Kentucky monastery); two harpsichords (antique replicas: one Italian, manufactured by David Sutherland of Ann Arbor, Michigan and the other Flemish, manufactured by John Lyon of Eastpointe Michigan); one fortepiano (also made by John Lyon); and one upright piano. Many of his former students retain an undying, fond memory of him and owe much to him for their musical skills. One testimony states that "He was a teacher of consummate skill for those who cared to learn". Another adds "Unselfishly, lovingly, extravagantly, Tom Kuras taught me the limitlessness of my potential to embrace, appreciate, and share music as a listener, performer, and conductor. This most amazing man showed me how to ‘let go, and let music." Another says honestly of Kuras that he was "the most brilliant, fascinating, irrational, insensitive, loving and infuriating man I have ever known or ever will know." And another, "I sang in the Philomusica Chorus for a while because I got better vocal instruction from those rehearsals than I had got from four years of voice lessons." "He was one of the best, if not the best choir director I ever sang under. … I learned more about singing than with any of my university professors." Another yet is Wayne Wyrembelski, now organist-choirmaster at St. Mary Cathedral in Gaylord, Michigan: "It was my privilege to study keyboard harmony, counterpoint and organ with Thomas Kuras. I began my studies with him while he was Cathedral organist at Blessed Sacrament in Detroit and continued them after he became organist at St Joseph Church. From the outset, I was in awe of his knowledge of music, his keyboard technique, his vast collection of music and recordings, and his prodigious memory. His performance cycles of the complete organ works of Bach, Widor and Franck were inspiring. I shall always remember the music he wrote for our wedding, the several pieces he dedicated to my family and the gifts he gave to our children. I count my years of study with Thomas Kuras, together with his unique friendship, among my richest blessings." As a jury panel member of musical contests, Kuras was attentive. The quote below, coming from a professor of piano, reflects perfectly Kuras’ state of mind: "He was wonderful with kids. He adjudicated for my piano students for many years before they went to festival. One thing that never ceased to amaze me was the way he could remember my students’ previous performances. All I had to do was give him the name of the piece the student had performed, and he could ‘hear’ the performance again and remember exactly how they played." Though passionate and intransigent on matters musical, he did not, for all that, disdain humor, and he loved to tell funny stories. One of his friends, the organbuilder William M. Worden remembers, "He knew what gifts he had. He could be arrogant about what he knew, but he was never arrogant about what he was. He knew it was a gift and he treated it like a kid with a new toy. He delighted in it, he’d turn it over and look at it, he was pleased with it, and he was thankful for it. Once in a great while, he’d give you a little sideways glance when he’d done something truly astounding at the keyboard and give you a sly little grin and say, ‘It just happens.’ And it was true. What is work for the rest of the world just happened for him." In addition to his numerous activities, Kuras also devoted time for composing. Most of his works were of a religious nature: vocal music, preludes, hymns and organ music for Catholic services. Among these, his Partita on the hymn tune "Austria" was published by the Detroit Chapter of the American Guild of Organists in 1977, then it was revised by the composer himself in 1987 before being reissued in 1998 by the St. Joseph Press (Detroit). This piece consists of six parts: Chorale, Pastorale, Choral Orné, Trio, Arioso and Fugue. The same press published another work by Kuras in 1997, a collection entitled Christmas Carol Preludes, consisting of ten pieces : 1 – Joy to the World (little Toccata on "Antioch"), 2 – Lullaby on "Silent Night" (con doppio pedale), 3 – Pastorale on "Adeste Fideles" (trio in the style of a French Noel), 4 – Cantilena on "O Little Town of Bethlehem", 5 – Pastorale on Two Christmas Carols "In dulci jubilo" and "Angels We Have Heard on High", 6 – Hark! The Herald Angels Sing (Canonic Organ Chorale inspired by "Gottes Sohn ist kommen" BWV 600, from the Orgelbüchlein), 7 – Ostinato on an Old English Carol "Kingsfold ", 8 – Trio on "It Came Upon a Midnight Clear", 9 – Pastorale on The First Noel, and 10 – Trio on " Kings of Orient". Let us mention further a work for organ, planned for future publication: Five Chorale preludes for organ on the hymn tune "Lauda Anima" and, for voice, "How far it is to Bethlehem", a motet for four voices (SATB) without accompaniment (also from St. Joseph Press). And among his works for chamber music, noteworthy is the Suite in C: Flute Clock Pieces by Franz Joseph Haydn arranged for three, four and five flutes by Kuras (1995, ALRY Publications, Etc., Inc.) and one volume of the Sonata in E Minor for flauto traverso and basso continuo RV 50 by Vivaldi (also by ALRY). - A boxed set of four CDs entitled Historic Organs of Michigan, produced by the Organ Historical Society in Richmond (Virginia; OHS 95), in which several organists interpret diverse works, among which Kuras sits at the organ of Saint Joseph (Detroit), playing the Marche des Rois Mages by Théodore Dubois, the March for Organ in E Flat by Lefébure-Wely, the Tema Varioto selected from the 12 Meditations for Organ, op. 167, no. 9, by Joseph Rheinberger, an anonymous piece called "Father, We Thank You," and two of his works, the lullaby on "O Sanctissima" and the Choral Orné (excerpted from his Partita on the hymn tune Austria), which is an homage to Charles Tournemire and, more precisely to his Suite Evocatrice, op. 74). - One CD, called Once Upon a Time, Songs of Love from Across the Ages, by Phil Micheal’s vocal ensemble Musicke’s Pleasure, includes the Kuras setting of Yeats’poems entitled "A Poet to His Beloved" (St. Joseph Musical Society, Detroit). - One CD, Everywhere Christmas Tonight by the same singers (Musicke’s Pleasure) includes two compositions by Kuras, one being a version of "Silent night." Thomas Kuras died of cancer on July 26, 1997, in his home in Birmingham, Michigan. On his headstone at Mt. Elliott Cemetery (Detroit) are engraved words from the eulogy by William M. Worden following the funeral mass: "He wore all of music as a seamless garment" as well as the Gregorian notation for In Paradisum deducant te angeli. This prayer, so well put into music by Fauré in his admirable Requiem, was frequently sung by Kuras at the end of funerals, using his own solo arrangement of the setting from the Requiem of Maurice Duruflè, one of his idols. After his death, a large part of his important collection of scores was given to Oakland University in Rochester, Michigan. Another part (chamber music, music for keyboard, choral music, operas) and a number of books from his library will soon find a home at the music department of Tulane University (New Orleans, Louisiana). Hurricane Katrina devastated a great portion of New Orleans and Tulane University. Kuras’ music will help jumpstart the rebuilding of its music library. As for us, we are preciously safekeeping a kind gift offered us by Kuras’ sister, Mrs. Rosemary Burgoyne, entitled Les Musiciens célèbres depuis le seizième siècle jusqu’à nos jours by Félix Clément, published in 1873 (Paris, Librairie Hachette, Gr. in-8°, XII-660 pages, 44 watermarked portraits). Thomas Kuras was a huge admirer of French authors, as so many of his books in his private library collection attest, and were written in Molière’s tongue. In his preface, Félix Clément affirms that music is an emanation of the soul and that the oeuvre reflects the man. A century later, these statements are once again confirmed in the life of Thomas Kuras, whose magnificent work does indeed demonstrate the nobility of his soul. 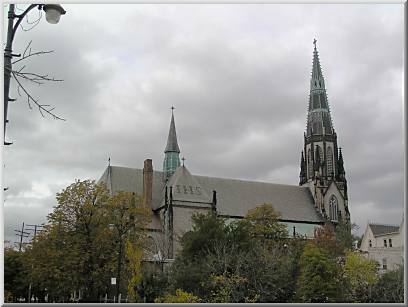 The fragments of the presented works are selected from a recital Kuras gave on the organ at the Saint Joseph church (Detroit) during a conference by the Organ Historical Society. We thank the director of this society, Mr. Ed Kelly (sound engineer) and Mrs. Rosemary Burgoyne (sister of the author-interpreter) for allowing us to post these audio samples on-line, without of course forgetting Mr. William M. Worden.